Came across a page with chart-modeling of media bias by patent attorney Vanessa Otero (@vlotero). At the link above, she explains her chart methodology. I don't see anything about blatant and excessive use of unnamed sources. 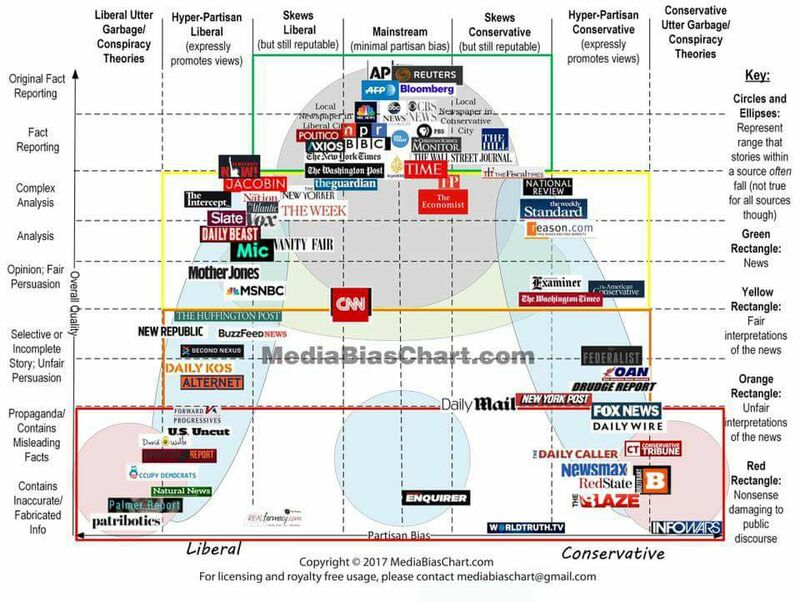 Great chart proving, once and for all, that MSNBC and Mother Jones are hardly biased at all. A chart made by a liberal for liberals. I'd like to see a chart made by a non-partisan group....if there is such a thing anymore. What's ironic is that she apparently has a blog called "All generalizations are false"...yet her chart is a generalization. I am curious about the methodology used to determine where to place each outlet. I don't disagree with much of the placing, except I wished they had created an entirely different netherworld for infowars. In general I think the Icons should be shifted Left a half square.... and I think that would be fairly accurate. Edit: I wrote this before I read comment #6. I rest my case. It seems like a reasonable chart, with significant room for good-faith disagreement. No. It says they are as biased as the Weekly Standard, the Examiner and American Conservative. Not sure if I would apply the same weightings, but that seems kind of reasonable. I read that as "definitely biased but not total garbage". YMMV. I find that that the media bias/fact check site is much more honest and objective in their evaluations. One must remember that most media bias is simply by omission (facts or events intentionally omitted) followed closely by using loaded words such as right-wing or far-left (quite selectively, of course) to refer to persons, places or ideas. There is no such thing as a "fair interpretation" of the news not showing bias - but I would accept a "fair presentation" of the news not showing bias. One of the most glaring examples of media bias (MSNBC and Fox News are prime offenders) is using live video footage of a "protest" yet not a lick of first person "on the scene" interviews of participants. Instead they bring in carefully selected "guests" to explain what the protestors "really meant to say".